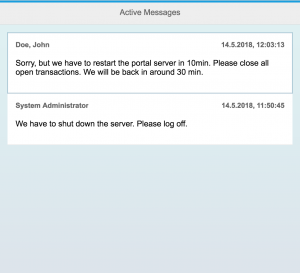 First and only messaging system available for the SAP NetWeaver Portal. 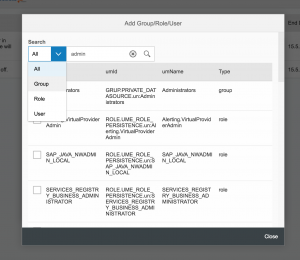 Create distribution lists for specific roles, groups or user directories. Pushing messages has never been easier. 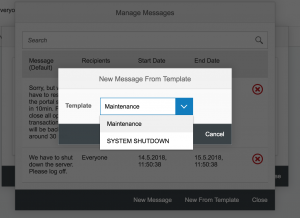 Schedule pop-up messages and set up templates for re-occurring messages – Plan ahead for portal downtimes. Broadcast instant alerts to quickly inform your users on portal emergencies, navigation or content changes. The System Messenger business package allows you to send instant or scheduled messages to your SAP Portal users. This application enables system or content admins to push messages to their end users based on their specific roles, groups and/or user lists. Keep your users up to date and well informed! Inside the SAP world, admins love the ERP R/3 functionality of pushing messages out to end users anytime they need to; e.g. a system problem or a scheduled downtime. 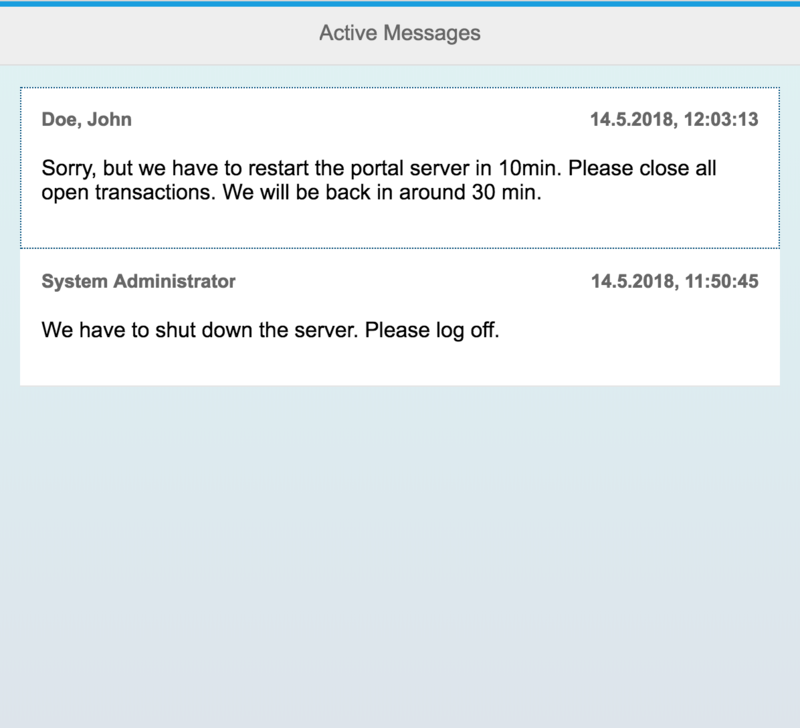 We know portal admins have been craving for this possibility of sending messages in the SAP Portal for years. And until System Messenger, the market had nothing readily available with this definite purpose and exact design specially for the SAP NetWeaver Portal. Is System Messenger for you? 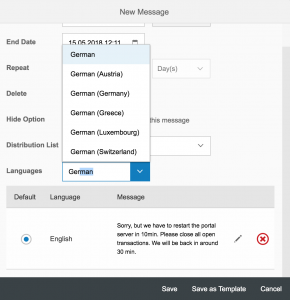 Do you liked the messaging functionality from ERP, but really miss it in the SAP Portal? 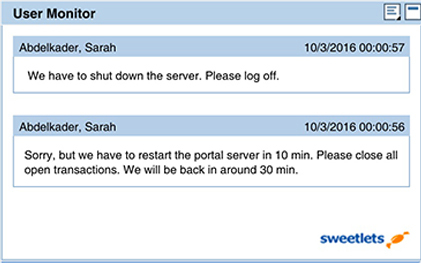 Have you ever needed to inform users about an emergency portal shutdown? Like right now! 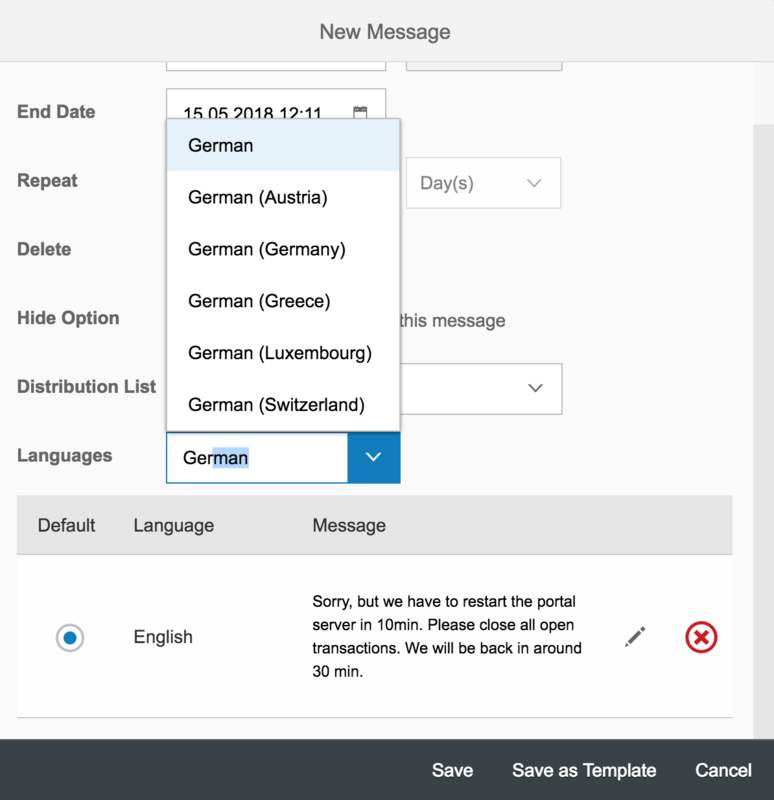 Do you ever want to inform users about navigation or content changes via a simple short message right inside your existing SAP Portal set up? How many times have you provide a new feature but no one used it because they didn't know about its release? For the length of your users log in, a System Messenger pop up iView will display any and all new messages. 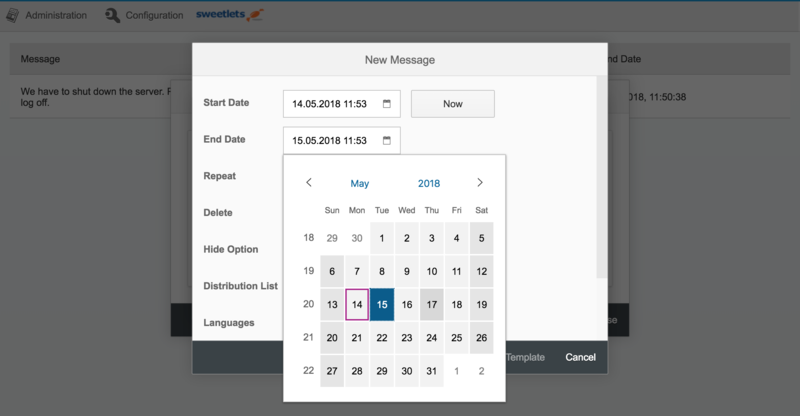 Sweetlets makes it easy to find out if System Messenger will solve your communication issues between you and your portal users. We freely offer you the complete business package to evaluate and use. Simply download the EPA, install the System Messenger application in your development portal and discover how easy managing messages can be. Still wondering if System Messenger is your solution? Send us an email to info@sweetlets.com or pick up the phone. We will certainly help or at least point you in the right direction. System Messenger not only sends a simple message to your SAP Portal users, but each communication can be configured in a variety of options. Keep your users well informed by broadcasting an instant alert, scheduled message, or a memo selected from your template list. Target specific roles, groups, departments, etc. With System Messenger’s unique filtering option, target a specific role, group, or department to establish a stronger connection with each community. 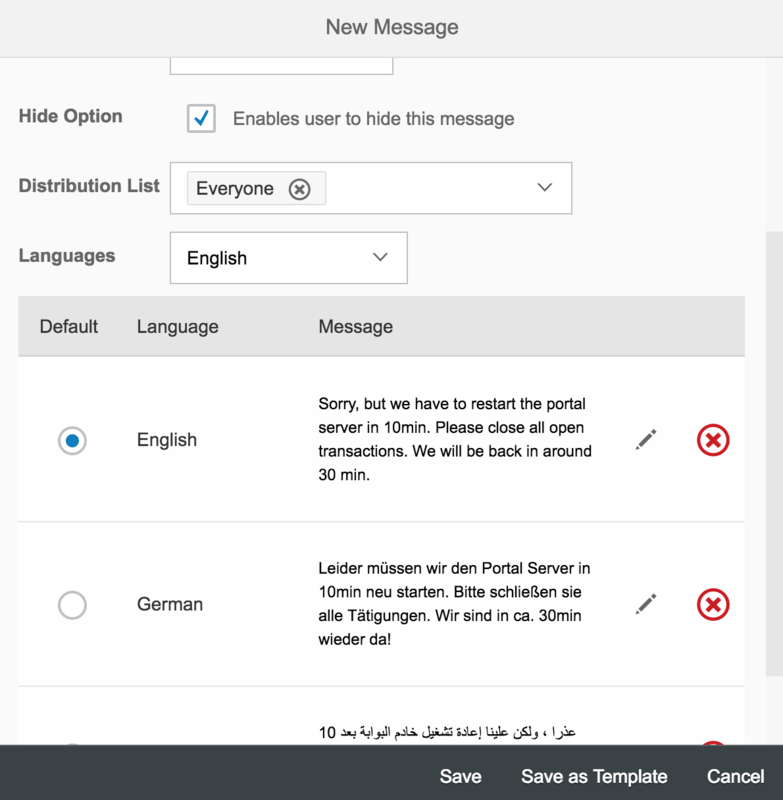 And never worry about a message sent to your HR department in another country and another language getting lost in translation - communicate with clarity using this apps multi-language feature. Search and choose from the specific groups, roles and users of your portal when creating a distribution list. Effectively communicate with your SAP Portal community. Keep your users intelligently informed and up to date. Download the complete documentation on System Messenger now. Without an effective way to communicate to your users, establishing and maintaining a solid relationship within your user community can be a real challenge. What does your firm actively do now to keep the lines of communication open between the company and its employees? Are users always well informed? The System Messenger app not only opens this line of communication from both ends of the spectrum, but makes it easier than ever to do so. Effortless contact with your employees creates a smoother running portal for everyone. Here are just a few time and money saving benefits you will receive once you take control and put this business package into action. The System Messenger iView displays all the active notes for the user who is currently logged in. 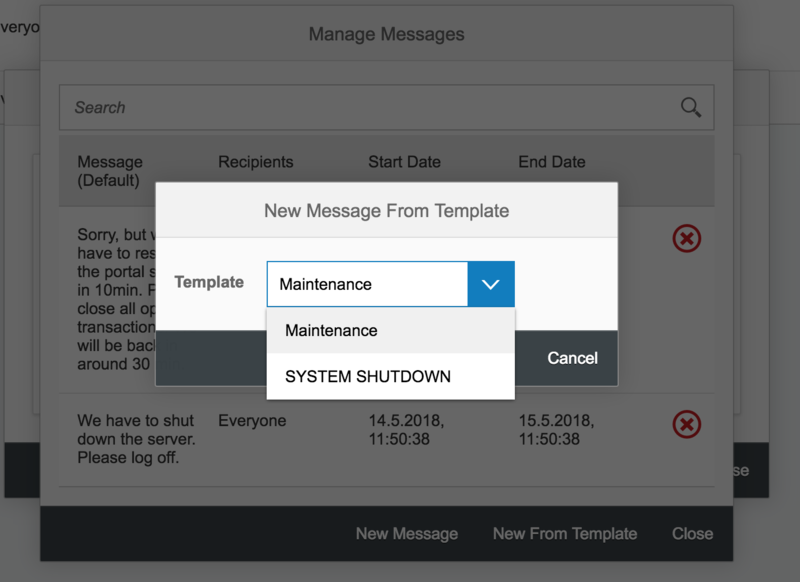 When it comes to deployment, System Messenger seamlessly integrates into your SAP Portal theme with the same look and feel of your current styling. Sweetlets plug n’ play installation requires no additional fighting on your end to configuration, set up or adapt message text. We understand the portal and know IT can be focusing on other important tasks rather than developing and maintaining such time and money consuming projects. Effectively manage your time by scheduling messages or selecting from your already prepared memos. Focus on other important tasks while at the same time having the peace of mind knowing your message has been effectively delivered and read by all your designated recipients – every time. And if you had to alert users about an emergency situation, never again scramble to notify them. At the click of a button, your urgent message can be delivered instantly – and to all the right parties. Select the publish date and expiration date of your message from a handy drop down calendar. Create integrity and build a relationship with your employees through consistent instructions and keeping them well informed. Avoid confusion between areas so the right people get the right message - send special notices only to designated user groups for security purposes and confidentiality; send link attachments to point departments in the right direction, keeping everyone on the same page; and conveniently send messages in the language of your end user so nothing gets lost in translation. Download System Messenger today and use this plug n’ play app in your SAP NetWeaver Portal to discover these and many more great benefits. Multi-language support. 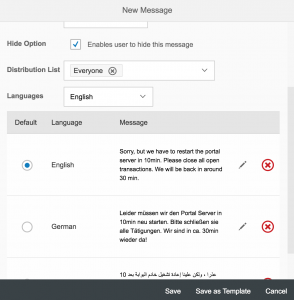 Avoid confusion - easily create messages for your users in their native language. Save time and establish consistency. Quickly create messages from your custom template list. Create templates for frequently used messages within minutes. A great way to keep and establish consistency with your users. How to download System Messenger ? Create an account on our "registration page"
Activate your account with the confirmation email sent to you. Follow email instructions to the right. Login to our downloads area with your username and password. (Find more information on how to migrate and upload portal application files on, “”) Please contact support@sweetlets.com for any additional help. Can we add our logo instead of the Sweetlets logo? The Sweetlets logo will disappear and you can add your own with product purchase and valid license. Please contact support@sweetlets.com for any additional help. Remote login to your portal server and start the SAP Management Console. Choose the J2EE system on which you want to start Telnet. 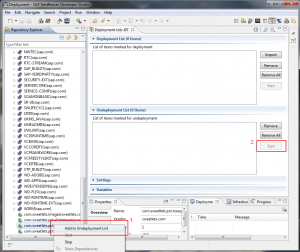 Navigate to the J2EE AS Java Process Table node. From the right-hand pane, select the ICM and select AS Java Telnet from the context menu. The J2EE Engine Telnet Administration Console opens. Enter a valid portal login to authenticate yourself. 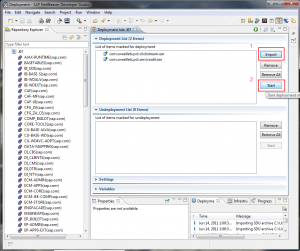 Execute the deploy command without an argument to switch the console to deployment mode. Execute the deploy command with path to the EAR location as an argument, along with version_rule=all as a parameter. Deploying the NW 7.30 Portal application files using NWDS You may also change your deployment strategy to always undeploy and version installed on the server. 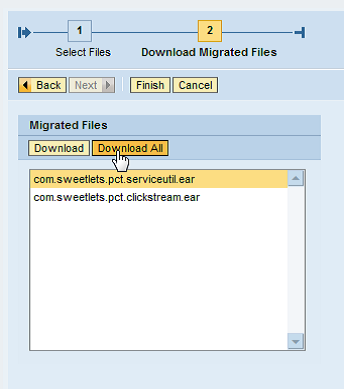 Download the EAR file from our website and copy it to the import directory similar to this: usr/sap/sapmnt/trans/EPS/in. Start JSPM using additional config parameter. Typically you can find the batch file to start JSPM here: usr/sap/<SID>/J00/j2ee/JSPM/go -config=/jspm/deployVersionRule=updateAll -config=/jspm/forceMode=true Starting JSPM on help.sap.com Please consider to use the <SID>adm or administrator user. Then choose package type Hotfix and click Next. Select the file to deploy and confirm by clicking Next. We recommend to remove the EAR file from directory usr/sap/sapmnt/trans/EPS/in after a successful import. Migrate PAR files that were contained in the EPA using System Administration > Support > Par Migration Tool. 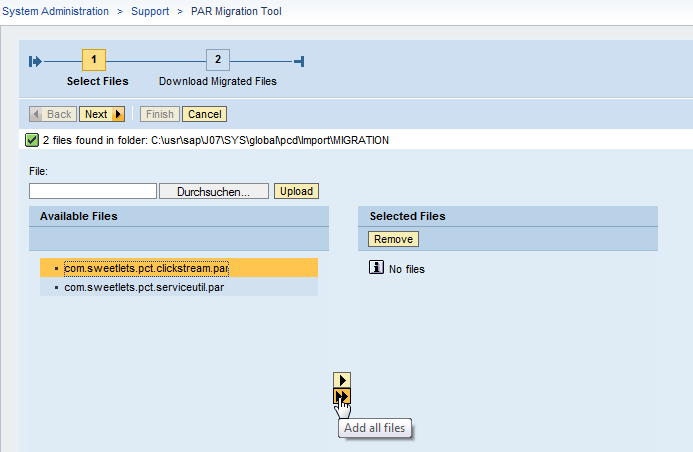 Therefore, check the box Add files … from imported transport package and click on Migrate. Download the EAR files and unzip them to a folder on the computer that you use for NWDS. Downloading the EAR files and unzip them to a folder on the computer being used for NWDS. Now you have the choice to use NWDS for deployment of the EAR files or if you choose to use the AS Java Telnet command line tool from SAP or JSPM running on the server. Please follow description above. For additional information, the SAP Community Network also provides some great insight into this procedure: How To Migrate Custom Portal Applications to SAP NetWeaver 7.3 Please contact support@sweetlets.com for any additional help. I have an empty Flash, what to do? Do you see an empty Flash? A right click allows you to select Play from the context menu? Please ask your administrator to verify two settings for the portal server. Please open: Visual Admin – Cluster – Server – Services – HTTP Provider – Properties. Our SWF files are compressed already. SWF (Flash) files need to be on the list of never compressed items, otherwise the server compression may cause an error in the SWF files that are loaded by the flash plug-in in your browser. Please contact support@sweetlets.com for any additional help. How can I verify my Flash Player version? Sometimes you need to update your Flash Player Plug-In for your browser to enjoy the latest and greatest. But, how to find out the current version you have installed? Please visit: http://kb.adobe.com/selfservice/viewContent.do?externalId=tn_15507 This official Adobe page can tell you exactly your major and minor version number. Please contact support@sweetlets.com for any additional help. Have technical issues? Contact our support team. A screenshot of the error if possible. Short Description: Who was doing what, when the error occurred? Relevant lines of the logfile or all logfiles as ZIP. Any other supporting documentation that may be helpful. Our support team is more than happy to help in your situation and will respond within 24-48 hours. Please contactsupport@sweetlets.com for any additional help. How do I remove a Sweetlets business package from the SAP Portal? **NOTE: Skip step A if you only used the Sweetlets Showcase! Please contact support@sweetlets.com for any additional help. We accept bank transfer, check and PayPal for your convenience. Volume discounts applies to multiple products. However, we do encourage installing our applications in your development portal to test drive. Get a more concrete feel of the power behind these business packages and the impact it can have in your SAP Portal. Try them today! Simply go to our Downloads page and follow the instructions. Please contact support@sweetlets.com for any additional help. Updates: All updates and patches for the specific release version purchased. Eg. An update is a move from a 1.1 to 1.2 type of change. Updates do not include major upgrades – a 1.x to 2.x change. Change requests: Many of our enhancements are as a result of client requests. If you have something you would like to see in the application purchased, we are always keen to work together to make our products better. Contact support@sweetlets.com with your request for more details. **Please note: Major upgrades are subject to an upgrade fee and not included in the annual support contract. E.g. 1.x version upgraded to a 2.x version Please contact support@sweetlets.com for any additional help. 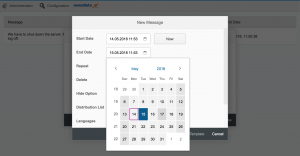 Based out of Munich, Germany, Sweetlets provides affordable, user-friendly business packages for use within the SAP NetWeaver Portal under the respected parent company, Pentland Firth Software GmbH. What makes Sweetlets unique from other software development firms is our exclusive focus in the SAP NetWeaver Portal space for over 8 years. Who else can boast this! The founders of Pentland Firth were instrumental in one of the very first implementations of the SAP Enterprise Portal 5.0, together with SAP in early 2002. These former big five consultants then created the notable Sweetlets brand in 2004 after seeing a clear void in the market for easy-to-deploy SAP Portal applications. For you, this means highly specialized knowledge when it comes to your SAP Portal. When you need your teeth cleaned, you don’t go see a plumber! So when it comes to your SAP Portal, talk to Sweetlets, the SAP Portal experts. To date, SAP Software Solution Partner Sweetlets continues to provide SAP-certified solutions based entirely on customers’ needs to an extensive variety of distinguished clients worldwide – in a broad range of industries. Please contact support@sweetlets.com for any additional help.